We have long known that smarter material choices for our roofs and pavements would lead to significant improvements in urban economies and quality of life. 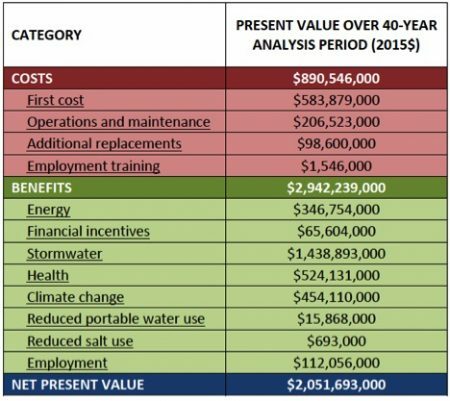 Now, a report for the District of Columbia municipal government shows just how big those net benefits can be by evaluating the potential costs and benefits of urban “sun and rain management” in the District. Cities that manage the sun’s energy with cool and green roofs and pavements and manage stormwater with green infrastructure will unlock billions in net benefits over the life of those investments. The report documents how D.C. could save $2 billion with smart surface strategies, such as cool roofs, green roofs, solar PV and porous pavements while enhancing health and livability and cutting summer peak temperatures. When increased tourism from more comfortable outdoor conditions are factored in, the net present value benefit exceeds $5 billion! Partners in this work include the American Institute of Architects, the National League of Cities, Global Cool Cities Alliance, DowntownDC Business Improvement District, the U.S. Green Building Council, the National Housing Trust and the Chesapeake Bay Foundation. For those looking to recreate this work in their city, the report includes a highly detailed walk-through of the methodology and sources for the findings. GCCA and ACEEE survey 26 cities to learn how they are addressing excess urban heat. This link will take you to GCCA's donation page. We are a project of Multiplier which accelerates impact for initiatives that protect and foster a healthy, sustainable, resilient and equitable world.